Article by Professor Academy of Arts Krylov A.K. | Biography of Tatyana Chernova. Article by Professor Academy of Arts Krylov A.K. 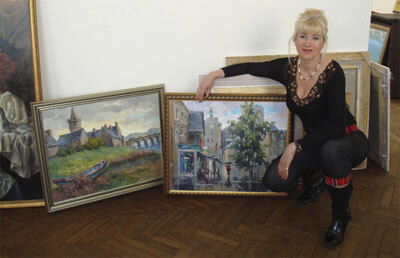 "The artistic world of Tatiana Chernova" - article by Balatsenko Y.D. Tatiana Chernova was born in St. Petersburg and graduated from its prestigious Mukhina Academy of Fine Art. One of her teachers was the famous, highly acclaimed artist S. A. Rotnitski. Since 1986 Tatiana has participated in the artistic life of St. Petersburg, developing her professionalism to even higher levels. She has participated in many exhibitions, including four in St. Petersburg dedicated to her work (1995, 1998, 2000, 2002), as well as participating since 1996 in the fall art exhibitions of the Russian Union of Artists in St. Petersburg. Tatiana’s works reside in private collections in many countries, including Russia, Italy, the Czech Republic, Germany, Finland, and Japan. The past decades have had their effect on the direction of Russian art: on the one hand, there has been a brazen conjuncture of official exhibitions staged under the pressure of time, and on the other hand, a withdrawal into the inert and formless, as if the free worlds of abstractness formed a special type of artist, who is unprecedented in the former Russia, speculating on lower tastes. Honesty and steadfast courage are required today in order to neither subordinate oneself to the economic laws of the artistic market, nor hide one’s indifference or simple inability to work with certain new ornaments of stylization, so that with sincere passion and an exposed heart, an artist can create and protect his or her own artistic style. It is difficult today to be an ‘artist of tradition. Painting the world from nature, it is necessary to have character and strong moral bearing in order to depict it simply and distinctly, admiring visibly the world’s beauty just as it is given by God to millions of people. Tatiana Chernova belongs to the group of devoted artists who work only from nature. Rain, cold, heat—an entire variety of natural impressions and associations, invariably pierced by a sharp feeling of the beauty of the world—complete the canvases of the artist with their lively breaths of fresh air. Nature for her is holy. The fluctuation of smooth watery surfaces, the worlds of flourishing grasses, the ample clouds in the azure sky, the trunks of stately trees and delicate vines—these details convey Tatiana’s eye for capturing multifaceted feelings and the voices and colors of many worlds, and show her to be an artist who is expressive and sincere. On Tatiana’s canvases, features are apparent which have characterized Russian art for centuries: the supremacy of meaningfulness above artificial perfection, above the deliberate meticulousness of artistic forms. This quality unconditionally redeems a certain plastic friability and the compositional inexactness which unavoidably accompany painting from nature. Tatiana is an avid traveler, and in this way her artistic landscapes have come into being, including those of Bulgaria, the Czech Republic, Germany, and Egypt, with their rhythms of life which are unusual for us, and their architectural motives and colorful melodies. This beautiful woman’s tremendous talent and capacity for work, as well as an irrepressible love of life, are seen as she carries her heavy weight of canvases and paints along the tourist and mountain paths of many countries. She paints flowers with a special feminine taste, admiring their freshness and the colorful glimmer of their magnificent or modest bouquets. These canvases are exquisite and full of Tatiana’s unique blend of delicateness, strength of floral harmony, and nobility of color combinations. The contrasting chords of color and pasty relief form a remarkable, picturesque fabric for these works. As a whole, the direction of Tatiana’s creativity may be designated by the stylistic boundaries of the Russian impressionism of the 19th and 20th centuries, our fascination with the artistic patterns and forms of which continues to take accord in our dreams about beauty, and even further in the future will continue to inspire our hearts. Tatiana’s creative potential grows with each year. Her adherence to traditions of the Russian school of painting, her love of life, and her ability to overcome the challenges facing painters today assure that Tatiana Chernova will accomplish even more in the world of fine art, and that some of her best works are still to come.